On its Sept. 15 kickoff, attendees at the Ponderosa Stomp‘s music conference learned about R&B legend, notorious transvestite, and pioneer rap promoter Bobby Marchan – in a panel led by Alison Fensterstock and illuminated by Marchan’s Manicure Records partner Henry “Palomino” Alexander; Q93 DJ Wild Wayne; and singer Gerri Hall of Huey “Piano” Smith’s Clowns. 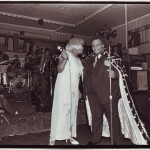 But before Marchan shared his consummate business acumen decades later with the rappers who founded Cash Money Records as well as chitlin-circuit stars like Sir Charles Jones and Mel Waiters, he made an impression as lead Clown vocalist, an emcee at New Orleans’ Dew Drop Inn and Club Tijuana, and later scored a #1 smash by covering the Big Jay McNeely hit “There Is Something on Your Mind” for Bobby Robinson’s Fire label. Be sure to listen to Marchan’s spoken interlude at minute 2:00 – pure tongue-lashing, sassy flamboyance infused with rap-like cadences. Friday, Sept. 16, Stomp conference attendees will get a chance to get up close and personal with the man whose version of “There Something on Your Mind” Marchan made his own: Big Jay McNeely. From 2:45 to 3:35, Jason Hanley of the Rock and Roll Hall of Fame will interview McNeely. For more conference info, click here. Catch McNeely playing the Stomp on Saturday night. Full schedule is here. 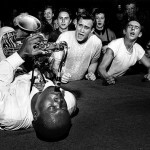 “The King of the Sax Honkers,” Big Jay McNeely first topped the Billboard R&B chart in 1949 with “The Deacon’s Hop” on the Savoy label before charting once again in 1959 with the blues-drenched ballad “There Is Something on Your Mind.” Infusing his style with a frantic preacher’s intensity that paved the way toward rock ‘n’ roll, the rabble-rousing McNeely – seen at left playing on his back – became known for his outrageously flamboyant stage antics as much for his trailblazingly torrential sax blowing, recording for many labels including Federal, Vee-Jay, Imperial, Exclusive, Aladdin, and Warner Bros. McNeely played at the inaugural Stomp 10 years ago, and we are pleased to have this legendary rock ‘n’ roll madman returning this Saturday night. Don’t miss it!